Al-Taqwa College (formerly known as The Islamic Schools of Victoria) is a P-12 Co-Educational School, with the aim of producing well educated and respected young Australian Muslims. The school offers a comprehensive curriculum, providing for all learning needs while embracing and incorporating the Islamic Ethos. Through its strong Discipline Policy, the school promotes the practice of high morals, responsibility for one’s own actions and self-discipline throughout the crucial years of learning. The school provides a supportive environment and provides compassionate support through the encouragement and development of faith through curricular and extra curricular activities. All Al-Taqwa College students must be in full uniform at all times. Failure to adhere to the policy will result in the student being sent home. Hats are required to be worn by all students during terms 1 and 4. All students who are in Prep to Grade 2 are required to wear the Al-Taqwa College sports uniform. The sports uniform consists of track pants, a polo top, either short or long sleeve, and a bomber jacket. Boys in Grade 3 to 6 are required to wear the College shirt, trousers, tie and a navy woollen jumper. Boys from Grade 5 to 12 have the same uniform but with a blazer. If belts are required, they must be black. Girls in Grade 3 to Year 12 are required to wear a tunic, shirt and the red woollen jumper. There are two tunics to choose from, summer (optional) or winter. Only the winter tunic is compulsory. Boys must wear black leather lace ups for the general uniform. All girls are required to wear black leather school shoes, which buckle up. Runners are required for sporting activities and must not be bright in colour. All boys must wear black socks at all times. Primary girls are to have black socks and secondary girls must wear white socks. The boys sports uniform comprises of track pants, a short or long sleeve polo top and a bomber jacket. The girls are required to wear long sleeves at all times. 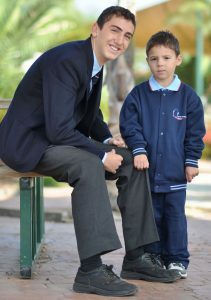 The boys’ sports uniform comprises of a short or long sleeve mesh polo, micro fibre track pants and a microfibre jacket. Again girls are must wear long sleeve polo tops. All girls are required to wear a white scarf, white undercap or white hijab. Al-Taqwa uniforms are available from PSW located at 1/16-17 Hammer Court, Hoppers Crossing. Please contact them for a current price list on 9768 0312.